Hi friends! 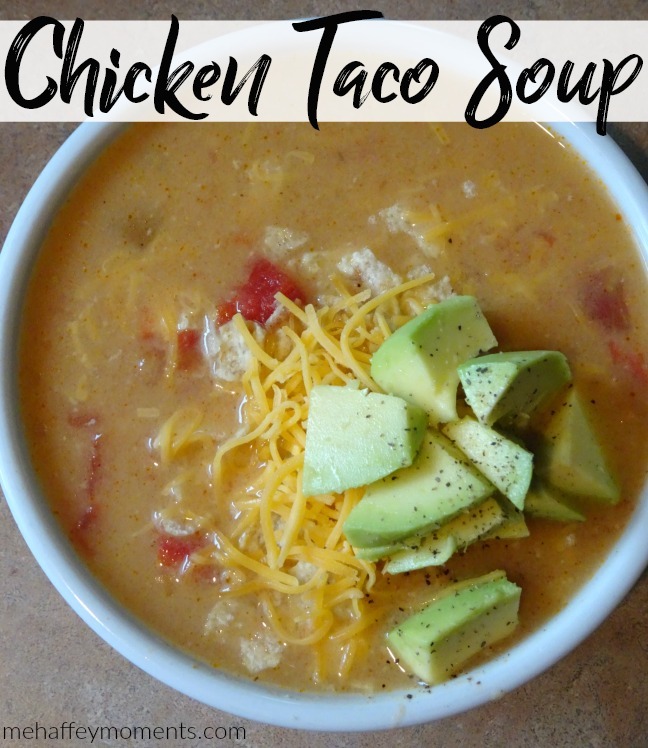 Today I have an easy slow cooker recipe for you, Chicken Taco Soup. I love this recipe because all you do is empty/pour in the ingredients, set it on low and it’s budget friendly! During the Fall & Winter months, I really enjoy making soups for dinner, especially when it’s cold outside. Nothing’s better than coming inside, taking all your gloves, beanie, jackets, boots off and sitting down to warm up with a nice bowl of soup. This recipe will be on my go-to list for sure! Slow cooker set to LOW 3-4 hours. Start by setting your slow cooker to low and place your slow cooker liner in. Empty your chicken broth, cream of chicken soup and taco seasoning into the cooker. Whisk until all ingredients are incorporated. Now add your can of diced tomato & green chilies, juice and all. Drain and rinse both black & pinto beans in a strainer, then add to your slow cooker. At this time drain your sweet corn and add it in, this is optional. Stir. Now place your chicken breasts in the cooker and close lid for 3 hours. At 3 hours take your chicken breast out and place on cutting board. With 2 forks shred your chicken breasts and add the shredded chicken back into the slow cooker for an additional 30-60 minutes. At 4 hours set to warm to serve later or turn off the cooker and let soup cool down a bit before serving. Ladle soup into bowls and garnish with your desired toppings. This recipe is a hit with the kids and husband! At 4 hours set to warm and serve later or turn off the cooker and let soup cool down a bit before serving. Let me know if you make this recipe and what you think, talk to ya soon!